Property 1: Spacious And Charming. Safe, Quiet, Convenient Location. Property 7: Brand New Modern 3 bed Villa in Palm Cay, a Gated Community in Paradise. WOW BE QUICK!! Only 2 available weeks until July!! Property 9: WOW BE QUICK!! Only 2 available weeks until July!! Property 10: Brand New Beach Front House - Salty Water And Sandy Toes!!!!!! Property 16: 5-Star Rated! ~ Charming "Buttonwood Cottage"
Property 20: BEAUTIFUL ISLAND RETREAT WITH STUNNING VIEWS AND BEACH! Property 21: Peace Of Paradise! Get ready to make awesome memories! 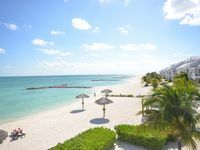 Property 22: Nassau's best!/Beachfront Luxury!/Therapeutic Waters! Casa Tropicanna is the perfect accommodation for a Family of Four. Property 24: Casa Tropicanna is the perfect accommodation for a Family of Four. The property is beautiful and secure. The Townhome is very plush and clean. Couldn&rsquo;t have asked for a better place to stay. Pictures only do it partial justice, much nicer in person. Loved the private beach and pool club.